How would you like to enjoy delicious soft ice cream that takes only two minutes to prepare? No ice cream maker required, just a hand held electric mixer and a freezer! Here is how I made it. 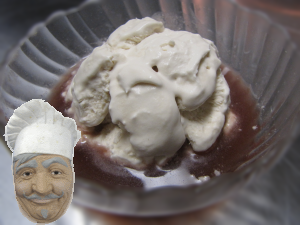 The trick with making your own ice cream is to prevent ice crystals forming in the cream as it freezes. This usually involves constant stirring. However, if you whip the cream, the presence of thousands of tiny pockets of air prevents ice crystals forming by providing an insulating barrier. The air pockets also soften the ice cream. But why doesn't ice cream made this way taste the same as store bought ice cream? Because store bought ice cream doesn't actually contain very much honest-to-goodness real cream anymore! I found the taste of this ice cream very agreeable. Vanilla is actually my favourite flavour. It is a very expensive and exotic flavour made from plants that only grow in very few places around the world. Why it is so maligned I cannot imagine. But, if you prefer, you can invent your own flavours. And finally, what if you don't have any caster sugar lying around in your kitchen? Caster sugar is very finely granulated sugar. Regular sugar is too heavy for the whipped cream which will tend to collapse under its weight. So, here is a tip: take regular granulated sugar and give it a spin in an electric coffee grinder! It works like magic. Enjoy.